As we have promised in our first event, TEDxJakarta team is back with the second TEDxJakartaSalon! 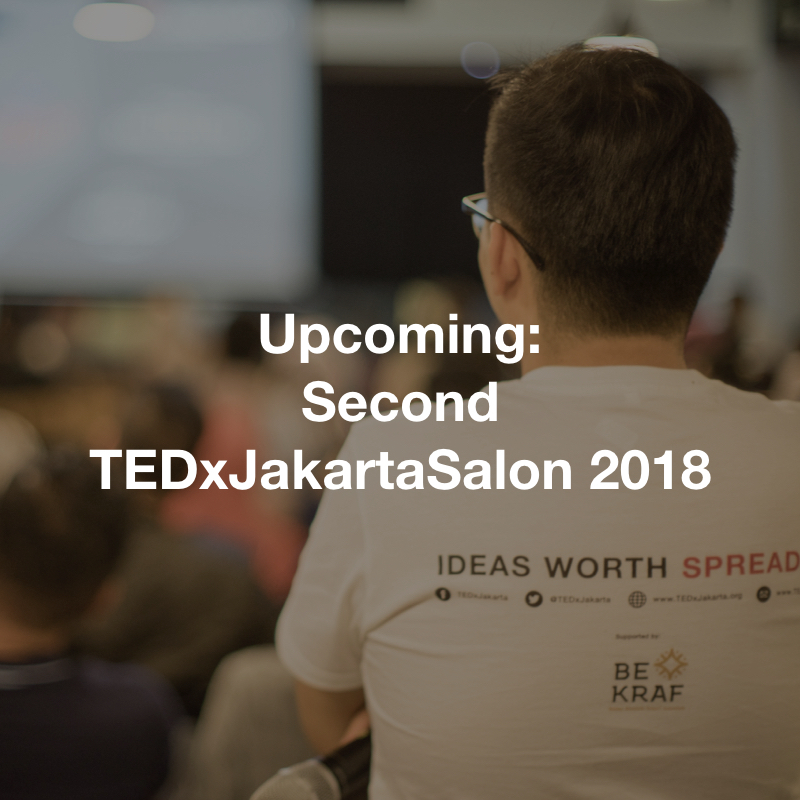 On the second TEDxJakartaSalon, we’re going to initiate discussion related to today’s policy making through screening of TED Talks videos, then heightened it with engaging conversations towards audiences. It will be a night of intimate and cosier gathering of our community. Registration will be done on site, first come first serve. This event is limited to 100 people only. Parking slots are limited so it is advised if you use public transport or share a car with your friends. Referring to global TED website, Salon events are often small weekly or monthly events that keeps a TEDx community engaged between annual TEDx events. Will there be live-speakers in the event? Not necessarily. At a TEDxJakartaSalon, the main bread and butter is to watch TED Talks and have informal discussions about the talks we have witnessed. We sometimes host a few speakers though it’s not always guaranteed. Can I pre-book a seat via a friend? No. You can’t. Please do come as early as you can. Is there any registration fee for in the event? No. This event is free of charge. How I can join this event? The registration is on the spot, and based on first come, first serve basis. If you want to join this event, just come over to the venue at D-day and register yourself. Is the event for hairdressers only? No. This event is for everyone. You will not get your hair cut, or done here. But surely your brain will be stimulated through TED Talks screening, and discussions with TEDxJakarta community. At a TEDx salon, attendees watch TED Talks, sometimes host a few speakers (though it’s not required) and have informal discussions about the talks they witnessed. Salons re-engage community and team during the time between official TEDx events, and spark discussion on issues of interest to local community. TEDxJakarta, curating ideas worth spreading since 2009.